Can you name a word that doesn’t seem to offend someone? Nearly every other word in the English language seems to be politically incorrect in the hyper-sensitive society we live in today. We can’t seem to simply live out our lives without looking for something to complain about. This week’s Theater of the Absurd award goes to Chelley Martinka, a Rhode Island mom, who has picked a fight with, of all things, a pickle manufacturer. 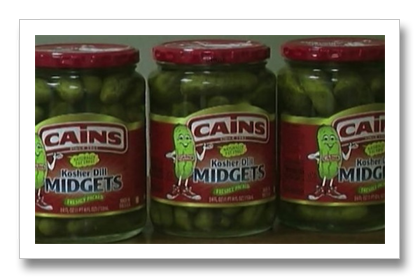 Martinka noticed that Cains, a popular pickle brand manufactured by M.A. Gedney Co., had a variety called “midgets.” Martinka’s 10 month old daughter was diagnosed with dwarfism shortly after birth. Somewhere along our political correctness journey the term midget became offensive to people afflicted with dwarfism and was shortly replaced with the term “little people.” Fair enough. But Martinka wasn’t satisfied with only the term being separated from little people, she wrote about the insensitivity of calling a pickle a midget, made a YouTube video and then contacted the company to complain about their 132 year history of political incorrectness. The company’s CEO, Barry Spector, called her earlier this month and said the company would comply and cease to use the term midget. When did we become so unbending, so rigid and so uncompromisingly sensitive that we could become offended by a word not directed at a person or group of people but at a pickle? Have companies become so cowardly that they won’t stand up for their brand because something, no matter how infinitesimal, can be twisted into some sort for personal slur? Toy maker Hasbro will produce a new Easy-Bake oven this year in the gender-neutral colors of black, blue and silver because a 13-year-old New Jersey girl took the firm to task for offering only pink and purple hues. Why stop there? Why not create a G.I. Joe Easy-Bake oven? How many boys are asking for Easy-Bake ovens? How many Easy-Bake ovens are sold for boys? None of that matters; it simply takes one person to throw society into a panic to correct a perceived wrong. Where’s the Combat Barbie? Shouldn’t Barbie be gender neutral too? This is ridiculous. 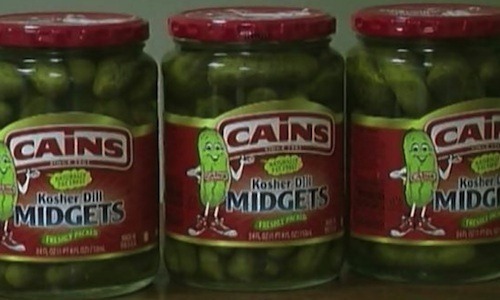 Martinka first called Gedney’s customer service department in December, registering her complaint about Cain’s “midget” pickles. She wrote on her blog the next day that Spector said “he agreed that in these times “midget” is offensive and he and the company would never want to offend anyone. Well the term pickle offends me. It’s not the name of a product but rather a process of using brine to flavor and preserve food. Pickles are cucumbers and I don’t think it’s fair to cucumbers to negate their contribution to society by naming them pickles after the process which saturates them with salt, which we know causes high blood pressure. Many people suffering from blood pressure disorders would surely be offended at the thought that companies are infusing salt into the lowly cucumber purely for profit. For the sake of not offending anyone the name pickle should be removed and replaced with “Salt infused cucumbers with spices.” Please, Heinz, step to the forefront here and right this pickle wrong. Political correctness makes people look stupid; but apparently Ms. Martinka doesn’t really care. Martinka’s midget pickle YouTube video got plenty of comments from folks who couldn’t believe the absurdity of what she was saying. One comment asked if she planned to try to ban the term “black” beans. The list of food products that have names that offend someone is probably so long that we’’ll be left with nothing to identify them with but numbers. Imagine going to your grocery store and asking them on which aisle you can find food product number 38? Fortunately not all food producers are as weak-kneed as Gedney. Pinnacle Foods, whose brands include Vlasic and Milwaukee’s, both of which have “midget” offerings, said it uses the word “midget’ in a technical manner. According to the United States Department of Agriculture a midget pickle is the designation for a pickle with a diameter of 19 mm or less. Martinka said she plans to take up the midget issue with Pinnacle. “My goal is to educate,” she said. This is one of those tough times where it’s hard to add anything to a story when its own silliness speaks for itself; time to go have a bowl of sugar-coated grain product in the shape of the letter “O” with a white liquid produced by the mammary glands of large mammals that graze on grass.